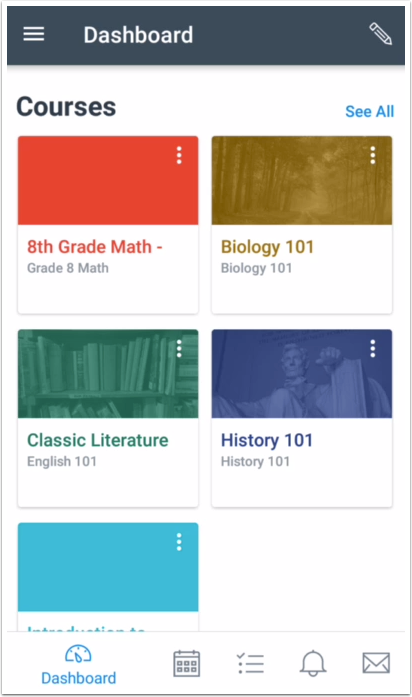 How do I view Courses and Groups in the Student app on my Android device? You can view all your courses and groups in the Canvas Student app. 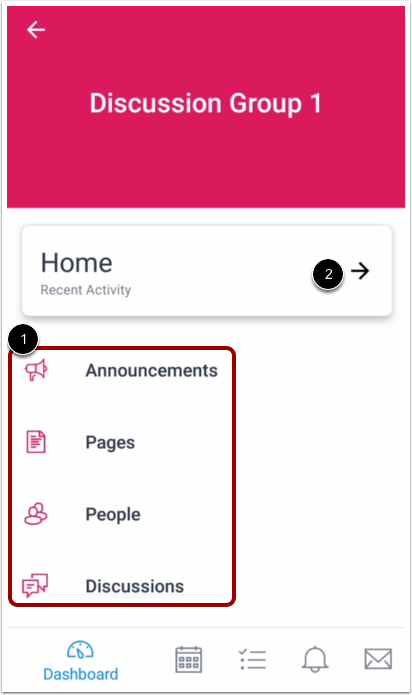 You can change your course favorites and change the colors for your courses and groups. Note: When you log in to the Canvas Student app, the landing page defaults to the Dashboard. Learn how to change your landing page. In the Dashboard, the Courses page displays all your favorite courses and groups. Favorite courses mirror the Courses & Groups customized drop-down menu in the web version of Canvas. To set or remove a course as a favorite, tap the Edit icon. Note: Changes to your favorite courses will apply to the browser version of Canvas. 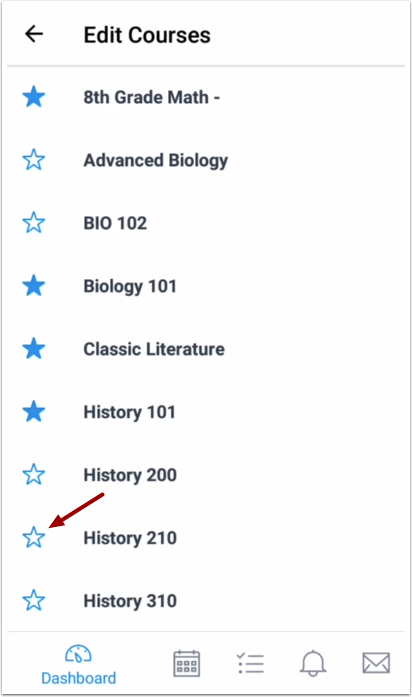 To favorite a course, tap the Star icon next to the course. Stars indicate favorite courses. To remove a favorite, tap the Star icon again. Changes to the favorites page are applied automatically. Note: The Courses list includes active and concluded courses. 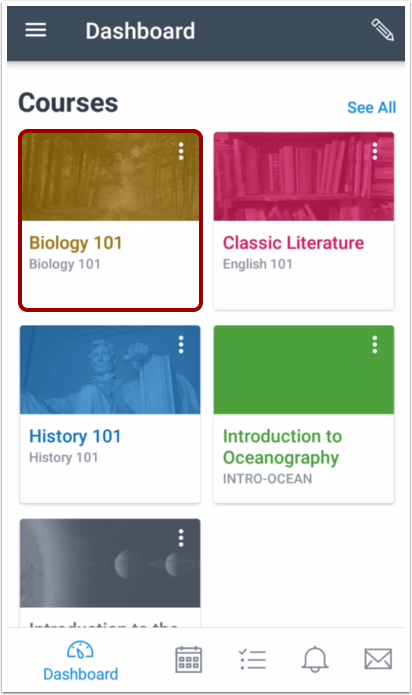 In the Dashboard, you can view overall grades for each course. You can choose to show or hide Dashboard grades. 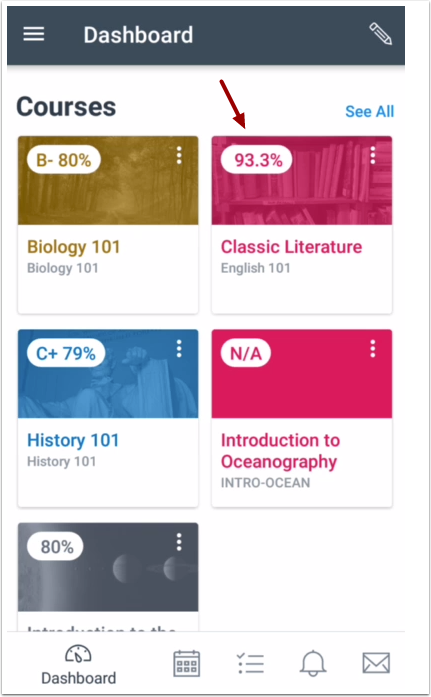 By default, grades are shown in the Dashboard. Learn how to show or hide grades. To view details of a grade, tap the grade percentage. Note: Users who do not have a student role will always see grades with a percentage of zero. Courses can be customized to help distinguish them throughout other areas of the Canvas Student app. To customize a course, tap the Options icon . 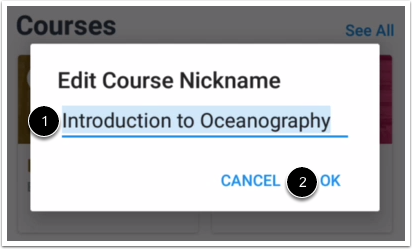 To edit the course nickname, tap the Edit nickname option . 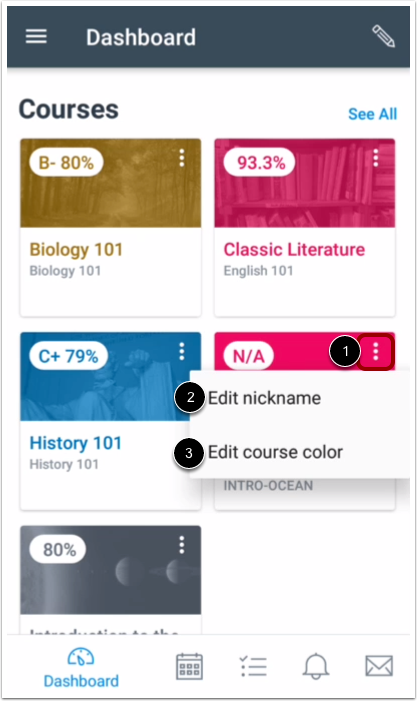 To edit the course color, tap the Edit course color option . Tap the Course Nickname field  and type the nickname. Tap the OK link . 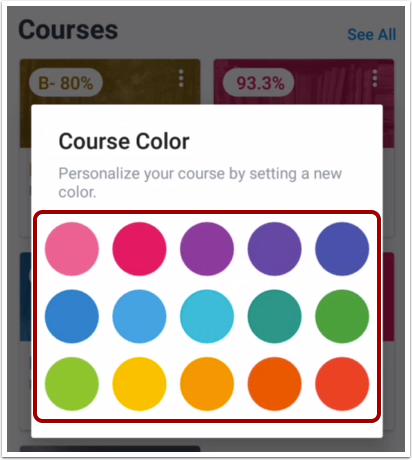 Tap the new color for your course. The color will automatically apply to your course. Courses open to the Course Navigation Menu . The menu includes course navigation links that are available in the browser version of Canvas. Therefore, if a course navigation link is hidden in the browser version, you will not be able to access it in the app. To open the Course Home Page, tap the Home button . 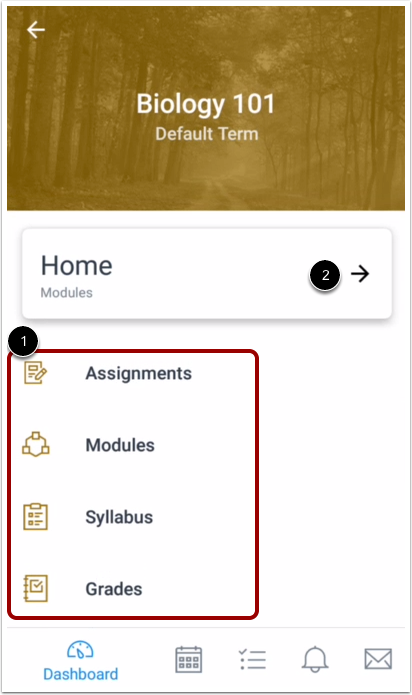 Note: Not all course navigation links are supported in the Canvas Student app. However, all navigation links are supported in a mobile browser. To open a group, tap the group name. Groups open to the Group Navigation Menu . The menu includes navigation links that are available in the browser version of Canvas. Therefore, if a navigation link is hidden in the browser version, you will not be able to access it in the app. 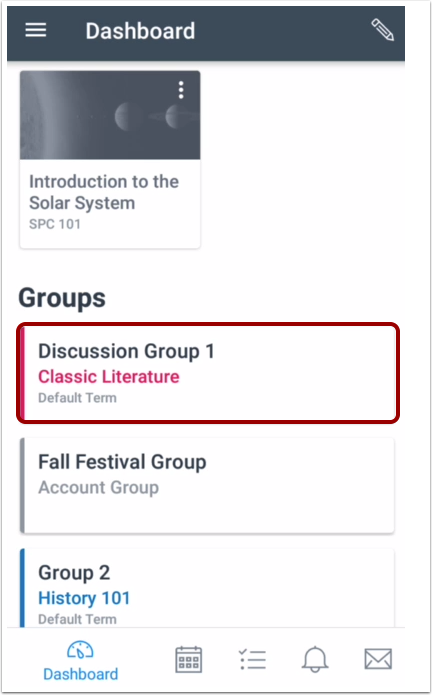 Note: Not all group navigation links are supported in the Canvas Student app. However, all navigation links are supported in a mobile browser. Previous Topic:How do I add a Canvas widget to my Android device? Next Topic:How do I reply to an announcement on the Student app on my Android device? Table of Contents > Course Features > How do I view Courses and Groups in the Student app on my Android device?